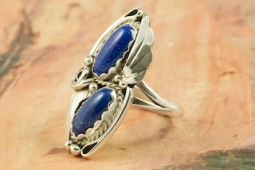 Genuine Blue Lapis set in Sterling Silver Ring. Created by Navajo Artist Justin Morris. Signed by the artist. Justin Morris incorporates meaning in his Sterling Silver Designs. The Sterling Silver Feather represents Life, the Shell represents Protection, the Circle of Life represents Balance and the Raindrops represent Abundance.